If you have questions email email me at: josefjmmegia@newcastlefans.com . 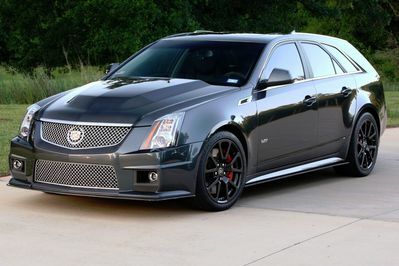 2013 Cadillac CTS-V Wagon. Thunder Gray ChromaFlair, 20.8k miles, 6-speed manual, Ebony Interior, Recaro Seats, Ultraview Sunroof, Satin Graphite Wheels, Wheel locks, Red Brembo Brakes, GM Export Differential Cooler, Midnight Sapele Wood Trim Package, Sueded Steering Wheel and Shifter, WeaponX “Sleeper” Carbon Fiber Hood. Always garaged, pampered and detailed; not abused. Clean, one-owner Carfax. Runs, drives and handles excellent. The wagon is extremely rare and in exceptional condition. 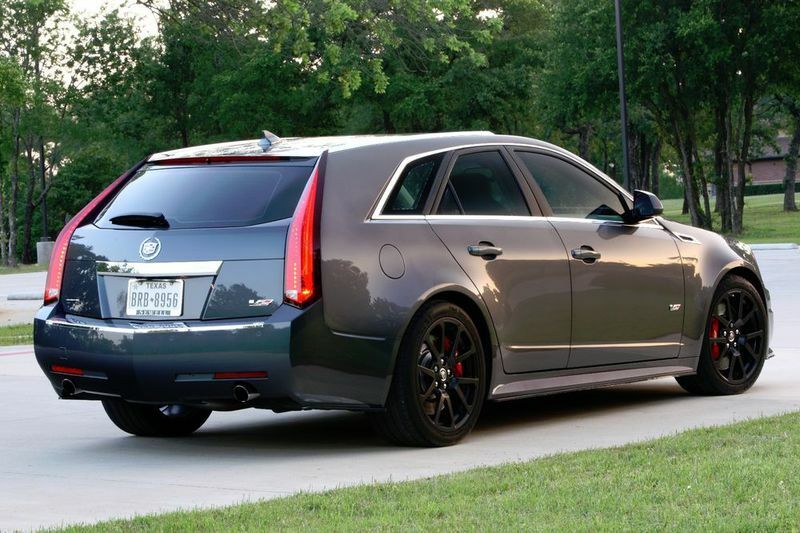 There were 416 CTS-V wagons produced in 2013 of which 113 were manual transmissions. Of the total 2013 manual V-wagons only 17 were produced in Thunder grey. This also has the rare and expensive GM Export Differential cooler (standard equipment on CTS-V’s shipped to Europe and the Middle East) and this fully loaded 6-speed is a rare combination perfect for a collector. All documentation (window sticker, PDI covers/tags, manuals; etc.) included in sale. The suspension has been upgraded to improve handling and durability with Whiteline rear bushings, Creative-Steel front control arm bushings (greasable) and D3 sway bars. Stock springs are utilized and the ride comfort is exceptional plus the handling has been significantly improved. The LSA engine (556 hp/551 lb. ft. torque) retains the stock tune and is supplemented with a Halltech Stinger Intake and V-Max Ported Throttle body for crisper throttle response. Additional supercharger cooling capacity and capability are achieved with a WeaponX Track Attack Heat Exchanger and a Lingenfelter Varimax heat exchanger pump. The stock hood is stored (included with sale) and a WeaponX Carbon/Carbon Sleeper hood with a “ZR1 Window pane treatment” is installed for visual impact and reduced weight. Expel clear bra protection installed on front bumper cover, hood, headlights, A-pillars, mirrors, lower panels and front of roof to protect paint. All windows and the Ultraview Sunroof are legally tinted to keep it cool inside and protected from damaging UV rays. Michelin Pilot Sport tires have 5k miles on front and 10k miles on rear. Sold with the currently installed WeaponX carbon fiber splitter and side skirts. The real carbon fiber skirts make the V-wagon appear lower and prevent road debris from flying up and damaging the sides of the vehicle. 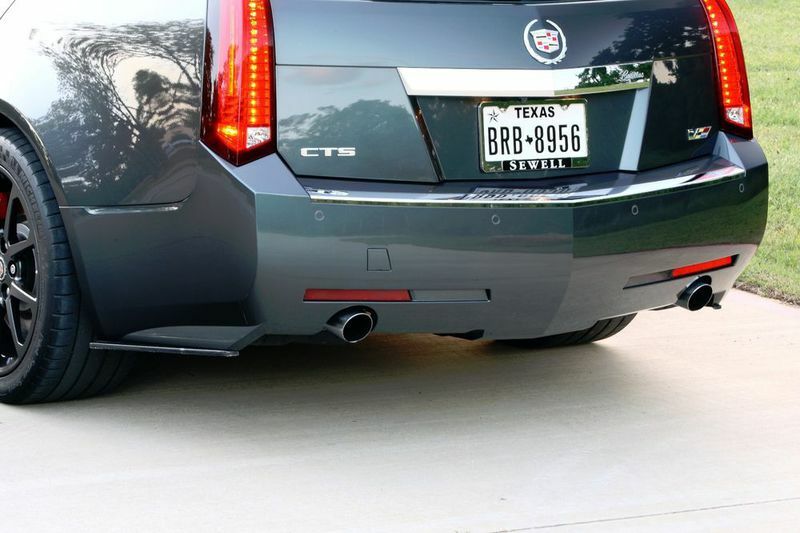 For a stock look, the skirts can be taken off in about 5 minutes and the front splitter can be replaced with the Cadillac 3-piece plastic splitter. Stock parts included: Stock hood, stock heat exchanger, stock sway bars, stock Intake and air filter, NIB (New In Box) OEM roof rails, OEM license plate bracket, NIB OEM carpet mat set, NIB OEM Safety kit).